The in-school residency fosters a sense of joy and accomplishment that DCP believes every child should experience. 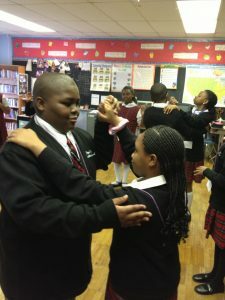 The residency is an in-school, standards-based social and emotional learning program that cultivates essential life skills in fifth and eighth grade students through the practice and performance of ballroom dance. Our core values of respect, compassion, humor, and joy transform our “ballroom” into a safe space where all students can succeed. The journey of dancing together calls on, and improves, a range of behavioral skills, including decision-making, goal-setting, communication, and relationship building, that are proven to provide long-term benefits to health and well-being. Read on for more information and to enroll. What is an In-School Residency? The program is structured around 10-week semesters. Classes take place twice weekly. All fifth or eight grade students and classroom teachers are required to participate. Teaching artists instruct students in social dance such as the merengue, foxtrot, rumba, tango, swing, and waltz and selected “sugar” dances–such as the cha cha slide and stomp. Each residency also includes a video lesson, a guest artist “buddy” visit, and curriculum connection assignments. Click here for an inside look at a buddy visit! Our Teaching Artists are carefully selected and trained in the Dulaine Method and the Dancing Classroom Curriculum, and use the vocabulary of ballroom dance to cultivate the positive feelings that are inherent in every child. The maturity necessary to dance together fosters respect, team work, and a sense of joy and accomplishment that DCP believes every child should experience. Our Teaching Artists also work very closely with classroom teachers to create curriculum connection assignments that support the academic goals of the participating class. In addition to work that supports academic content areas, students write reflections to voice their feelings about learning to dance and work with classmates. All participating schools finish with a “Culminating Event,” after which selected students can take part in the optional Colors of the Rainbow Team Match events. The Culminating Event is a highlight of the residency for all members of the school community. Students, parents, and teachers come together to celebrate the social development of the dancers, as well as to enjoy an elegant dance performance! Since 2008, medical residents at The Children’s Hospital of Philadelphia (CHOP) have collaborated with Dancing Classrooms Philly to deliver five brief interactive lessons that illustrate the health benefits of dance to one school per semester. The doctors present five mini lessons about the brain, lungs, heart, musculoskeletal system, and nutrition for 15-20 minutes prior to the beginning of the dance instruction. The health lessons address serious health concerns that are prevalent in our inner city population including asthma, diabetes and obesity. This program is an important addition to the curriculum as many schools do not have health classes. Click here for information on school requirements and pricing. To request an application and enroll your school, please contact us at info@dancingclassroomsphilly.org or call the Managing Director, Kate Lombardi, at 215-268-3973.